It is not so difficult! You land at that lavish Terminal 3 of Soekarno-Hatta International Airport (half of things do not work here, already, or ‘yet’, but the terminal does look lavish), you can take a luxury limo to one of so many 5-star hotels, have meetings at a steel-and-glass office tower, dine in a posh mall where nobody shops (a money laundering concept), but where those with unlimited budgets, often dine. After all this you can leave thinking that Jakarta is just cool–bit ‘shallow’, too loud and too vulgar–but a ‘kind of cool’ city. But in between, there are the so-called kampungs–‘villages’–where the great majority of Jakarta’s citizens live. A Kampung sounds romantic, but in reality, it is not–anywhere else on earth it would be called a slum. The slums of Jakarta and in fact of the entire Indonesia, are rat-infested, open sewage colossuses, with dark narrow alleys, toxic canals, and extremely limited access to drinking water (water in the capital was privatized by French and British companies, and as a result, the quality dropped and prices became unrealistically steep for the majority of people). Except for just a few tiny dirty specks of green areas, and the most of the time closed small square in the center of the city called Monas, Jakarta has no public parks. Forget about public playgrounds for children, or public exercise machines! In fact, Jakarta has nothing ‘public’ left. Nothing ‘belongs to people’–as everything was sold, corrupted, grabbed and privatized. A family of 4 has to pay around 7 USD to even enter Ancol, the only available beach area, despite the fact that Jakarta is theoretically a maritime city. But even in Ancol, despite the entrance fee, the tiny beach is littered with garbage, and a narrow promenade is broken and outrageously filthy. Otherwise–there is nothing! Poor are used to being poor, obedient and ‘entrusting their fate into God’s hands’, in the Indonesian language called pasrah. And the rich are secretly laughing at the poor, all the way to the bank. I know them, the rich of Indonesia, too. I worked, for decades, with Indonesians from across the spectrum–from the poorest of the poor, to the richest of the rich. The Indonesian poor have no idea that they are poor, they ‘thank God’ for what they have, or, more precisely ‘do not have’. And the super-rich looters are proud of their achievements. They are hiding nothing. On the contrary–they flash their wealth, knowing that they are above the law, or any moral principles. They drive their Mercedes limos right next to the slums, without fear. They are actually respected, not only feared. The more they steal, the more they are admired. Not long ago, they put into prison the former moderately left-wing governor of Jakarta, known as Ahok, for trying to improve the infrastructure, sanitation and public transportation. The official charge: “insulting Islam”. A bad joke, really, as almost all Indonesian linguists agreed that there was no insult whatsoever. But again, it worked: to do something for the people, one risks being branded as a socialist, or a Communist (which here is illegal). To pay too much attention to the wellbeing of the common citizens may brand you as an atheist, which is also illegal. So, if you build a few new train lines, a few sidewalks, erect a couple of parks; you are risking ending up deep behind bars. 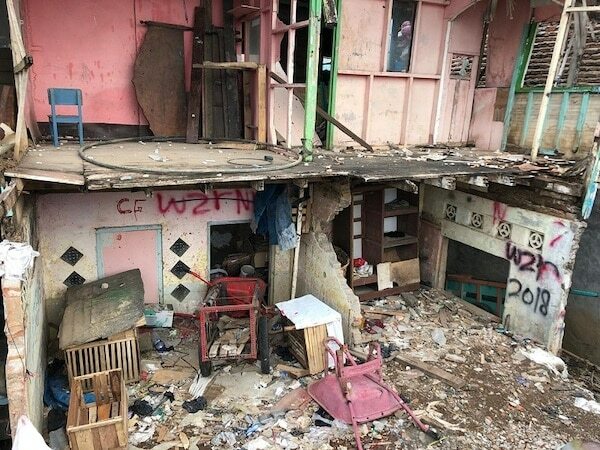 Religions–be they Wahhabism or Pentecostal Christianity–have, for decades, been fully encouraged by the West, which is gaining greatly from destitution, ignorance and the obedience of the Indonesian masses. Read the U.S. and European newspapers and you will be told that Jakarta is a ‘sprawling metropolis’, that Indonesia is the ‘third biggest democracy’ (my god, according to them, India is No. 1), and that the Indonesian religions are moderate and tolerant. Deeper thoughts are discouraged. Pop culture–its lowest grade–is literally everywhere. Intellectually, the city has been ruined since 1965. I film broken pavements–tiny narrow sidewalks made from unmatched tiles, polluting scooters and unhygienic eateries blocking the way of the few daring pedestrians. Why is all that happening? Because nothing public is respected or put together well. Everything that is not for a fee, is simply dreadful. And it is designed to remain that way. Jakarta is not just a city–it is a concept. Perhaps it should one day become a verb–“to Jakarta”. That would mean, to sacrifice people to greed, corruption, business, religion and foreign interests. All this explains why I often come to both Borneo and Jakarta–to work on films, to define and document the horror, to warn the world what has already been done to the Indonesian nation. I try to cut through lies. I try to explain that Dilma Rousseff, the former President of Brazil who was impeached (during a constitutional coup) because of the ‘massaging of statistics’ before the elections (something that is commonly done in many countries including those in the West) would have to be, theoretically, executed by a firing squad, or quartered by a mob, if she were to do proportionally what the government of Indonesia is doing without any scruples or second thought. In Jakarta, they do not ‘massage’–they pervert, lie, and call black, white, and day, night. And they get away with everything. No one dares to challenge them. And they get rewarded by the West–as long as they rob the country and its people of everything, and deliver huge part of the loot to the gates of Washington, Canberra, Paris and London. The Economist once described Indonesia as the least documented large country on earth. Right. And there are many reasons for it. I often describe 1965 as a “Cultural Hiroshima”, because almost all the intellectuals were either, killed, imprisoned or muzzled–overnight, and on the direct suggestions and orders from the West. In reality, the majority of local families, according to my own survey, lives on US$2-3 dollars a day (family of 4-5). Food in supermarkets costs 2-8 times more than in places like Germany. Therefore, the supermarkets are empty. The Majority of people shop at pasars–markets, where food is often full of cancerogenic chemicals, and filth is everywhere. Everybody thinks the same. There is hardly any variety. It is scary. Indonesia feels like North Korea, as it is presented by the West and its propaganda. But North Korea is actually totally different–there I found definitely much more intellectual diversity than in Jakarta! Nobody wants to change things–at least not the system, the essence. People want “more money and better life”. Is their life bad now? “No!” Do they hold their elites responsible? “For what?” They don’t understand–they don’t know what I am talking about, or pretend they don’t know, when I ask such questions. And the rich? Their kids are in the U.S., Japan or Europe, studying how to screw their own population even more, after returning back. For them, the greatest pride is to work for some foreign company, or to be awarded with the Western diplomas, and to be given some reward from Europe or the United States. But it is my duty to speak. Therefore, I speak. And write. And film. And as my maternal Russian and Chinese grandparents did–I fight against fascism, regardless of the cost!